Selecting size LM-Activator 2 is available in 16 different models. The Low model is applicable to many different cases according to the table of indications. The High model is thicker in the region of second premolars and molars. It is specifically designed for treating skeletal and dentoalveolar open bite cases. Both the Low and High models are available in two lengths. The Short model with a shorter molar section is for patients whose second molars have not yet erupted. The Long model with a longer molar section is for patients whose second molars have erupted or are about to erupt. The Narrow and Wide models refer to the dental arch width. The Wide model is applicable for patients with a wider dental arch. The dental arch width of the Narrow model is the same as in the first generation of LM-Activator. 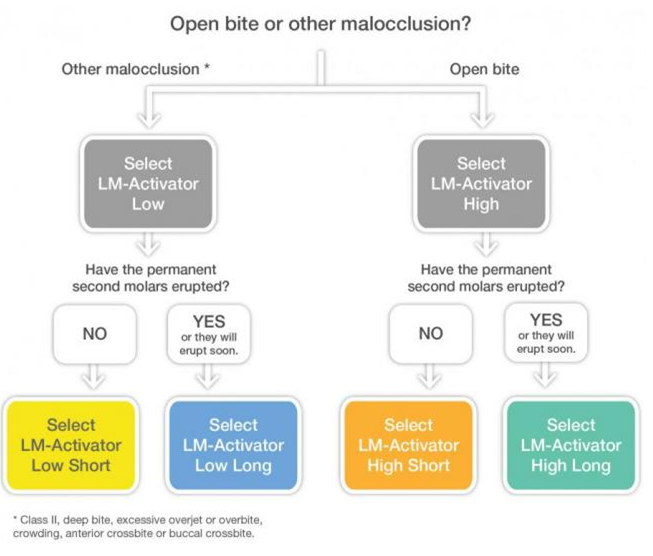 LM-Activator 2 Reinforced with harder material in the incisal area is especially designed for deep bite, but it is also suitable for other patients that can benefit from a firm anterior region or improved durability and wear resistance. The model without reinforcement is suitable for patients not requiring a rigid incisal surface and improved durability in the incisal area. A total of 128 different model and size combinations makes it possible to select an LM-Activator that is appropriate for the patient without the need for individual modifications. LM-OrthoSizer is a measure for aiding the selection of the appropriate size. It measures the distance across the upper incisors and indicates the corresponding size. Place the elevated marker between the left maxillary lateral incisor and canine. In case of crowding or diastemas, consider a larger or smaller appliance. Fit LM-Activator on the patient and double check that the teeth sits properly in the slots. Fitting is the most important step of size selection. Appliances used for fitting can be sterilized in an autoclave. Fig. 1. The canine rests at the bottom of its slot and LM-Activator places no mesiodistal-force on the canine. If there is no crowding or risk of crowding, the size in the photo is correct. However, if crowding is present or expected, a larger size should be selected to enable expansion of the arch perimeter. Fig. 2. One size larger than in Fig.1. The canine is guided by LM-Activator towards the bottom of the canine’s slot and applies a force that pushes the canine distally. This size is appropriate if crowding is present or expected and arch perimeter expansion is needed. Fig. 3. Three sizes larger than in Fig. 1. The appliance is too large. The canine is guided against a ridge between two slots and the appliance does not guide teeth properly. Choose a smaller size. Sterilize LM-Activator in the autoclave.